Over the last few days the post-antique history of the plaza is starting to become clearer, thanks to new arrival Christina, invited by Axel from Berlin. Christina is an experienced digger who manages her own recording and has been digging a section trench through a missing part of the west colonnade. She has revealed that there was indeed a great hole made here, probably during early medieval times, almost certainly in order to remove a threshold block, where there had been a door of some kind. Interestingly, the stonerobbers who recycled this stone also cut through a very late wall composed on tile, pot and random fragments, which was discovered by Axel in the first week of cleaning. This wall perhaps dates from the troubled years of the seventh century AD. It runs over the ruined wall of the west colonnade and its composition – of jumbled material – suggests it was made out of a field of ruins, rather than made with the selected brick and stone of a well-organised spolia trade, as we see in late antiquity. Were these constructions private usurpations of public space? Perhaps, as they do not seem to respect earlier alignments of the plaza. 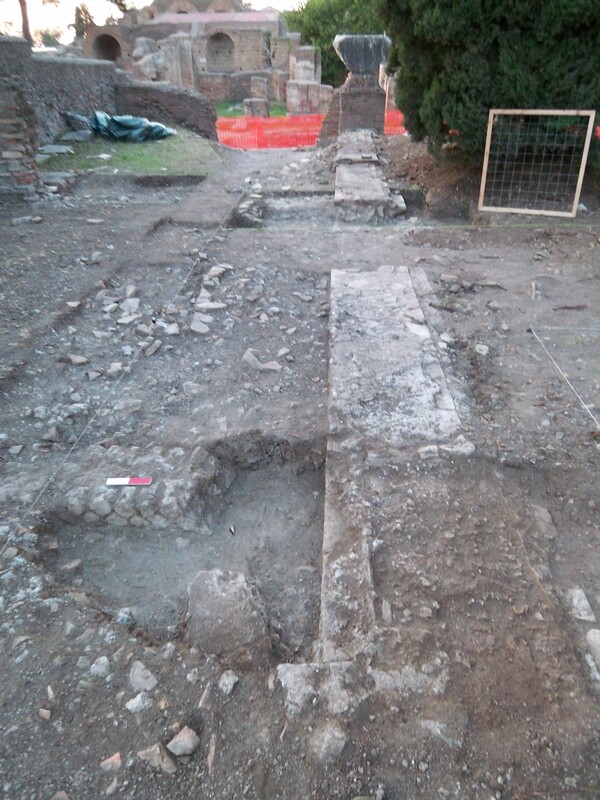 The wall is curved – could it be part of a church apse? Probably not, as it is too irregular. Next year’s digging will hopefully provide some answers.